First of all, thank you, gentle readers and friends, for your kind and loving comments on my Abrupt.Leaving.Slowly post. It’s been three weeks now since my father died. Time begins to work its singular magic. The sun rises and sets; days spin by, each shortening as the planet tilts further toward fall, and grief softens, giving way, gradually, just as summer’s heat dissipates into autumn’s lapis skies. The light changes come September — it’s cleaner, brighter, more forgiving. We’ve endured summer’s intensity, and now go into this “handing-over time,” as Marv and Nancy Hiles dub autumn. I for one, am ready. Handing-over is the constant lesson. I mean this literally — that grief gives way. I’ve found, thus far, that it is unpredictable, surprising, catching me in unguarded moments with quick, sharp pangs, and then I get right back to checking email or tossing the dinner salad. Grief has given a way to learn more about who my father was by listening to memories shared and stories offered by his friends. And it has made way for simple pleasures, too — getting handwritten cards with a real postage stamp on them; the bittersweet rich indulgence of Bert Wood’s chocolate cake, baked (with a boozy kick) by my cousin Mallory; the gracefully bowed orchid presiding over the living room coffee table, sent by Noel’s family. The permission to unplug and be unproductive for a bit is perhaps the best gift that grief has given me. In the lackluster days post-memorial service, I did what I almost never do — curl up with a book, in the middle of the day. 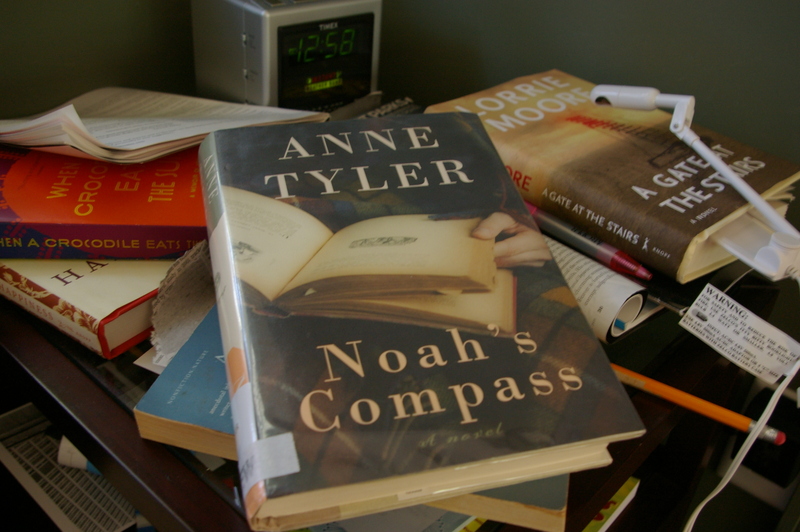 Anne Tyler’s most recent novel, Noah’s Compass, proved to be the perfect literary balm. Light enough reading — her typical tragicomic novel — but with masterful depth of character and Tyler’s quintessential quirkiness that makes my dad’s eccentricities seem ever dearer. It’s the story of 61 year old Liam Pennywell, who’s never amounted to much and faces his later years newly laid off from a lame job and mired in quiet desperation. And yet the novel is touchingly funny and a grand celebration of life’s unglorious moments, when we neither sink into despair nor force some faux self-delight but instead, settle for what we have, as mundane and odd as it may be, and accept it as a gift. ~ by Stephanie on 09/20/2010. Seems that you are chugging right along in your new normal. Enjoy your wording of your thoughts put down in print form.